Monitoring your heart rate effectively, and being reasonable to planning the movement. Record your daily activities, you could check daily activities including steps, distance and calorie consumption in the App. Device could automatically recognize your status and monitoring the whole sleep progress with analyzing the deep sleep and light sleep hours. Alarm alert, call alert, sedentary alert, ect. by silent vibration. When the smart phone is beyond the Bluetooth range(no more than 5m), the device vibrates to remind. Device key could remote photograph shooting. 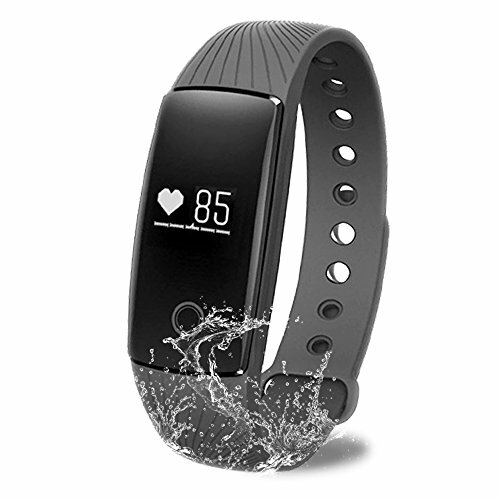 Waterproof Rating: IP67 Life-level Waterproof, Sweat-proof, Rain-proof;Not for Diving or Swimming. 1. Please stop using it when any discomfort symptoms happen. 2. The heart rate testing data can not be used as medical data. The time will a little longer for the first time testing, it is normal. 3.The initial use requires charging to activate the product, make sure that the normal power, the bracelet will automatically boot. 4.Please don't wear it to swimming. 5.If you have any problem, please contact with me, I will be very happy to solve your problem.